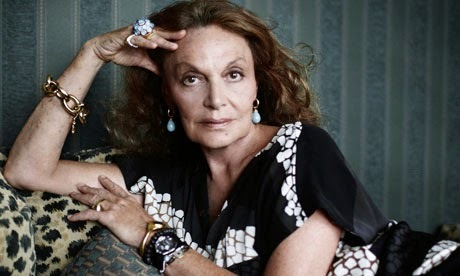 Diane von Furstenberg is such a fashion icon. She's a trailblazer in so many ways. She brought us the wrap dress, has been a major supporter of anti-piracy legislation for fashion on Capitol Hill, and worked with fashion law leader Susan Scafidi in establishing the Fashion Law Institute. Now, she's commanding fair treatment of models as NYFW gets rolling this Wednesday. Sure, fair treatment of models is nothing new. We've talked about labor issues models face and the work Stand Up For Fashion (STUFF) has done. The push from such a fashion powerhouse just might be, though. For years, major fashion week participants have been scrutinized for their lack of diversity in runway shows and the self-esteem damaging atmosphere for the models they do choose. As longtime President of the Council of Fashion Designers of America (CFDA), Ms. von Furstenberg is saying loudly--no more! Along with CFDA CEO Steven Kolb, Diane has penned a letter, encouraging this upcoming fashion week be just as much about debuting new trends and styles as it is debuting new attitudes. She continues to remind us, beauty and fashion start on the inside. Check out the letter for yourself. We love DVF, don't you? !